Pinterest, the website which lets people collect and share photos online with a “virtual pinboard,” has steadily amassed a very dedicated following of users that spreads far beyond the app-obsessed early adopter crowd. On Tuesday, a new study out of content sharing company Shareaholic showed just how powerful the Palo Alto, California-based startup has become. Pinterest is now driving more referral traffic on the web than Google+, YouTube, Reddit, and LinkedIn — combined. 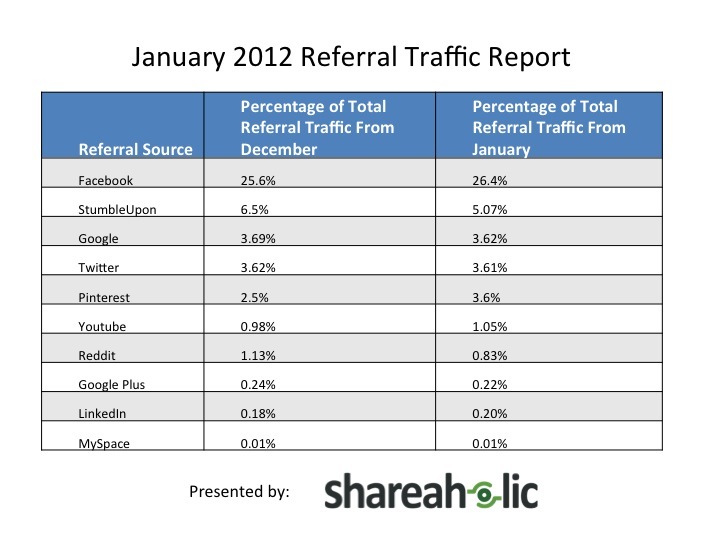 That’s according to Shareaholic’s January 2012 referral traffic report, which is based on aggregated data from more than 200,000 publishers that reach more than 260 million unique monthly visitors each month. In January Pinterest was responsible for 3.6 percent of referrals tracked by Shareaholic, up from 2.5 percent during the previous month. That means the site is quickly gaining ground on Twitter, which drove 3.61 percent of referral traffic in January, down from 3.62 percent in December. Pinterest’s ascent has been especially rapid when viewed through a longer lens: The site owned just .17 percent of the traffic in Shareaholic’s July survey. Not surprisingly, Facebook is holding steady at the top of Shareaholic’s survey, as it was responsible for more than a quarter of all referral traffic in January. Next in line was StumbleUpon, with 5.07 percent. It bears mention that while the Shareaholic survey is global, in the United States market alone StumbleUpon has in the past unseated Facebook as a top driver of referral traffic. It’s exciting to see a relative newcomer growing so quickly in the web space. While the web’s more established companies are quite powerful these days, the fact that a startup like Pinterest has successfully established its own foothold shows that the competitive landscape is still alive and mainstream users are open to trying things from new players. Yikes. This meaningless data has gone viral. You have got to be kidding me. The social media manager for Constant Contact has twisted the words around and is now reporting that Pinterest is driving more WEB traffic than the major players COMBINED. It is laughable that Google is in 3rd place on this chart and YouTube is in 6th place on this chart. That alone makes you question what the hell is going on here. Hi everyone! We have found Pinterest to be a great tool for our A Modern Dad community for discussing relevant books and product, and providing parenting advice and recommendations… http://pinterest.com/a_modern_dad/. My question is so what? The nature of the latter four sites is to trap users on those sites, not to refer traffic to other sources. Where is Tumblr? Let’s make this a complete real picture. I see the same things on Pinterest every time I visit (a) desserts (b) wedding dresses (c) bare-bodied hunks (c) high-heeled shoes. I would hope that there are lots of other things shared on the internet that do not fall into these buckets. Really? I can’t get Pinterest to do anything. It routinely says, “no video or picture here” to sites I’m on that I want to share. I find it rather useless. HOW is it driving traffic anywhere? We made a list of pinners to follow on Pinterest: http://www.pinnerstofollow.com that includes brands, celebs, tastemakers and just awesome pinners. Would love to see Pinterest build a tool like this into the site. Those are some interesting figures. I wonder what the data from Addthis or a larger social sharing platform would show. Yes, Pinterest is a busy place, changing constantly. It seems like the sheer volume will cause it to break soon. But we said that about Twitter, didn’t we? And Twitter does occasionally slow down. My problem with Pinterest is that it only serves my personal side with pretty pictures of things I like or want. It doesn’t serve my professional side where I sell a service. Hard to picture a service, isn’t it? I’m striving to come up with a way! Even if your numbers aren’t accurate, we all know Pinterest is big and getting bigger. Thanks for the fascinating article. Sally try infographics to convey the white paper case studies, icharts.com is another way to represent information graphically. Hi Sally, thanks for your comment. The amount of data they are serving is pretty massive — the technology under the hood is something I’m hoping to dig into in a future story. love the concept but had issues with pinterest 502 server timeout errors almost every day so i went with juxtapost.com instead. its the same idea but with a lot of automation built in to make adding my stuff easier. I’ve had the same experience lately and I’m looking into juxtapost. have you tried http://www.polyvore.com/ for Fashion? Sorry, but this is meaningless. There is no real info on the way the data was measured, except that it was done by some company which claims all sorts of numbers. There must be something sketchy either about their definition of referrals or their measurement system. You can’t actually believe Pinterest drives more traffic than Twitter, right? Another critical issue that isn’t even mentioned is the use of mechanisms that hide referral data. I’m pretty sure Google does this by default, so in almost all cases traffic coming from Google sites will not be registered as such, and obviously completely ruin the value of any such “study”. Thanks for weighing in Nadav. You make a good point about the mechanisms for hiding referral data, so traffic studies by third party sites will always be a bit skewed. But the main assertion that Pinterest has become a huge traffic driver on the web seems legitimate to me. The site is very popular and has gained lots of ground among mainstream web users. Agree, Colleen! The overarching message that Pinterest drives that much traffic is an interesting trend for bloggers to ponder. Thank you so much for this write-up! I love your attention to detail when it comes to data – we’re lucky we have people like you adding to the conversation about content measurement. We pulled these numbers from a global dataset of more than 200,000 publishers who reach more than 260 million unique monthly visitors. That is a statistically significant dataset. And to clarify Pinterest did not surpass Twitter. With a dataset this large, the difference of .1% is worth noting as those are a lot of visits. Thanks for your response, but I’m afraid you haven’t really clarified much in the way of your measurement system. Would you care to comment about the possibility that your system may be unable to correctly count referrals from Google or others? While we’re talking statistics, it really doesn’t matter how much data you have in absolute terms. The question is if this data is representative. If you are missing, let’s say, half the referral data, and most of that missing data comes from a single or few sources, then your statistics are almost meaningless. If Facebook and Google each send the same amount of referrals, let’s say 20% of total referrals each. If you now take out the Google data, you end up with 25% for FB (25/100 = 20/80) and ~0 for Google, despite still having what you call “a statistically significant dataset”. Imagine you throw a game dice a million times, and count how many times you got each result. You will converge on 1/6 for each number. Now if you decide not to count any roll that landed on 5 or 6 and simply ignore it, you will actually converge on 1/4 chance for the other options and 0 for 5 or 6, while counting most (2/3) of the rolls (“statistically significant dataset”…). All of my above assumptions are quite plausible, unless you tell me otherwise. I’m sure you’re familiar with the phrase “There’s lies, damn lies and statistics”. With next to no info on your dataset except for its absolute size, I can’t attach any significance to your findings. This data is meaningless without more information about how it is calculated. Are you only measuring traffic on links that are submitted through your tool, or all referrals to a site? @Nadav, thanks for breaking this down. @Janet, can we get your response to this? Clearly, you don’t have a site that caters to Pinterest’s audience. If you did, (like I do) you wouldn’t question these numbers at all. The proof is in the referral data – Pinterest drives between 5% and 10% of total traffic to all seven of my websites.